Between now and 2016, male unemployment - especially that of young men - will be the defining issue for a Republic that guarantees 'the happiness and prosperity of the whole nation'. The Smart Economy strategy is part of the solution - but as Stephen Kinsella points out, this is merely a strategy of 'trickle down employment' that fails directly to address the most pressing problem. That problem is the large number of young men - unskilled or with the wrong skills - comprising a large part of our live register. All this talk of unemployment is preposterous. Think of it. We live in a world with lots of imperfections, things that need to be done. It has always been so and always will be so. That means that there is always work to be done, and therefore, always jobs. The problem of unemployment is a problem of disconnect between those who would work and those who would hire. What is the disconnect? It comes down to affordability. Businesses right now can't afford to hire new workers. They keep letting them go. 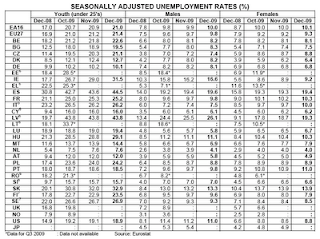 Therefore, unemployment is high, in the double digits, approaching 17% or more. Among black men, it is 25%. Among youth, it is 30% or higher. And the problem will continue to spread so long as there are barriers to deal making between hirers and workers. Again, it is not a lack of work to be done. It is too expensive to pay for the work to be done. It's down to basic economics: if you want to increase the demand for something, lower its price. What are the things that influence the price of labour in Ireland right now? The first of these is the minimum wage. As I've explained before, the minimum wage is a barrier to entry that prevents small businesses from setting up in competition with larger, incumbent businesses and undermining their profits. The hilarious thing is that left wing champions of the minimum wage are actually championing higher profits for big business! At least, it would be hilarious if the consequences in terms of the wasted lives of so many young people were not so tragic. But there are other, more pervasive and insidious costs that push up the price of labour - especially the price of unskilled labour. These include the disgrace of employer's PRSI: a tax that, as an employer, I must pay to the state - on top of employees' wages - simply for hiring people to work for me (8.5% in the case of the lower pay bands). It's a form of VAT on employment, and as our Minister for Finance discovered last year, when you increase VAT in the face of falling demand then you will find yourself losing rather more revenues than you thought you would gain. Then, of course, there are the many, many rules, regulations, laws and standards that employers are obliged to observe in the course of a) hiring and b) employing someone. As NERA reminds us, employees have rights but employers only have responsibilities. If all the Labourers in a Village breed up several Sons to the same work there will be too many Labourers to cultivate the Lands belonging to the Village, and the surplus Adults must go to seek a livelihood elsewhere, which they generally do in Cities: if some remain with their Fathers, as they will not all find sufficient employment they will live in great poverty and will not marry for lack of means to bring up children, or if they marry, the children who come will soon die of starvation with their Parents. Meanwhile back here in the 21st century employers face a very different reality. The same Richard Cantillon pointed out a long time ago that 'the entrepreneur is the person who buys at a known or certain price to sell at an unknown or uncertain price'. The same goes for the purchase of labour. The only certainty I face as an employer is the price I will have to pay my employees in the form of wages and salaries. What I will then be able to earn by employing them to meet the needs of my customers is highly uncertain. But every increase in the price of labour then increases the uncertainty that I and other employers face with regards the future. The window of success - wherein the price I charge exceeds the price I pay - gets narrowed to the point where hiring more staff is no longer merely risky but increasingly looks foolish. Everything that increases the cost of employing the young and the unskilled therefore guarantees that they will remain unemployed. And that is a tragedy. By preventing them from getting on the ladder of employment and job progression - with the prospect of higher wages and salaries that experience and training will bring - then we effectively deny them a future. That's not just a tragedy, it's a disgrace. It is time for Cantillon's heirs - Irish academic economists - to be brave and to demand the removal of those 'taxes on jobs' that presently condemn a generation of young men to a fate no more rewarding than that of Cantillon's labourers and their sons. I meant to add that the chart is from the latest Eurostat figures for unemployment in Europe. More disturbing is the table accompanying the chart on youth unemployment - which shows that Ireland has the second highest level in the eurozone and fourth highest in the European Union. Note also that Ireland has the highest gap in the EU in terms of male versus female unemployment - 17% vs. 9%. Hence my focus on male youth unemployment - just in case the feminist mutaween think I'm guilty of sexist thought crimes etc. Professor Laffer was famously said to have convinced Pres. Reagan of the diminishing returns of higher taxation by grabbing him for five minutes at a dinner table and sketching his famous 'curve' for him on the back of a napkin. I think you could spend a month sketching out Laffer curves on napkins for our politicians and they'd still be scratching their heads in befuddlement. Just like the 1980s, it will only be after permanent damage has been done to the economy that our leaders will be dragged kicking and screaming to do what should obviously be done immediately. It is the nature of the system, which deems any change to the status quo to be anathema. So, let's change the system. I think I was one of the few academic economists who was fairly publicly critical when the minimum wage was introduced. Got a certain amount of grief over it & not much else. I found it disturbing that there was a whole slew of well-meaning people who just couldn't see what a lousy idea it was. At the time it was introduced, the labour market was very tight and the government was smart enough to introduce it at a rate that was probably at or below the market level. So it probably didn't cost any jobs and they got the plaudits. Now I think it would be very different, especially with deflation and collapsing demand for labour. The other thing to remember is that there are policy complementarities or interactions. So if you are going to reform the minimum wage you need to think of changing other policies, for example benefits policy in this case. But these are probably the domain of different departments and the chances of joined-up thinking is slim. 2. All of this demographic stuff is depressingly reminiscent of the 1970s and 1980s. But didn't we then realise that the demographics were really our friend ? The "real " Celtic Tiger owed much to our demographic profile. Much has changed for the worse in the meantime, admittedly, but we can still make it a positive.